Myers's Rum Original Dark Rum Review the! Myers’s Rum as recognisable a Dark Rum as Bacardi Superior is a White Rum. World Famous proclaims the bottle and for once this isn’t marketing hype. Myers’s has been in production since 1879. It is a blend of up to 9 continuous and pot stilled Jamaican rums. It is aged for up to 4 years in small oak barrels. The rum is produced by National Rums of Jamaica Ltd (Long Pond/Monymusk Distilleries) and is bottled by Myers Rum Company in Nassau, Bahamas. The front of the bottle states that is the company which succeeded Fred L Myers of Kingston, Jamaica. The rear of the bottle states that the rum was imported into the UK by Fred L Myers and Son Co. London. The brand overall is owned by beverage powerhouse Diageo. 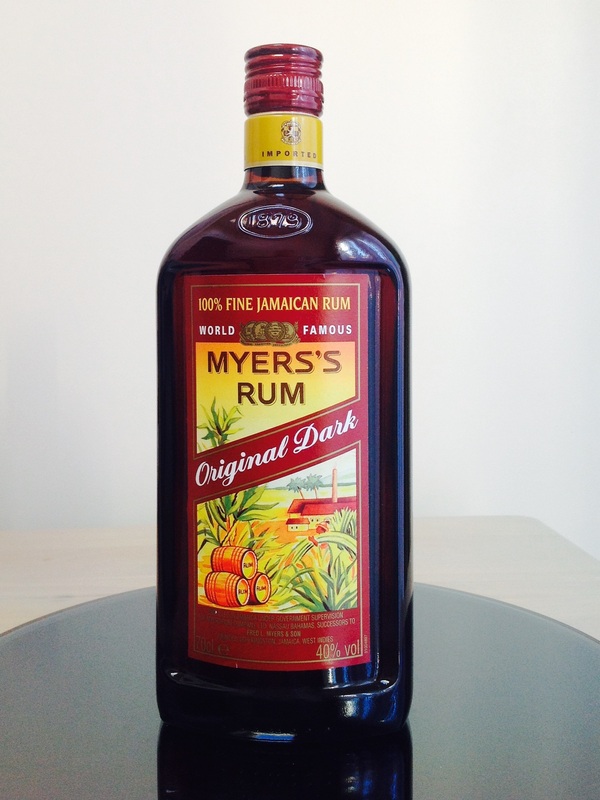 Myers’s Rum Original Dark is available in the UK for around £20 per 70cl bottle. It is bottled at an ABV of 40%. Other variants of Myers’s rum such as Legend are available internationally but I have never seen anything other than the Original Dark available in the UK. Myers’s Rum is housed in a distinctive almost rectangular bottle with a long body and a very short stubby neck. The bottle and labelling have changed very little over the years. From looking a the bottle this is easy to believe. Like Skipper Rum the bottle has a very kitsch 50’s or maybe even earlier type feel to it. The picture is that of a distillery with some rum barrels and sugar cane at the fore front of the picture. Myers’s Rum is clearly stated on the front. The look is distinctive. The bottle is very dark which reinforced the message of Original Dark emblazoned across the picture. The presentation gives the rum an authentic feel. This isn’t going to be a faddy new sweetened rum. This is real rum like what your grandfather might have drunk. Prior to reviewing my rum’s I always have a few evenings in the company of the rum. This is to ensure my first impressions are not too enthusiastic or I am too harsh in appraising a more challenging rum. Even now I am still not beyond changing my ratings of certain rum’s. Often after many months. Myers’s Rum is not a rum which should be reviewed or appraised at the first visit. It is a bold rum big on flavour. The palate needs to adjust to such flavoursome rum and learn to appreciate it. You almost feel that you need to earn the respect of such powerful rums! Another practice I undertake prior to reviewing rum is to seek out other reviews of the rum. Usually I do not even look at the score or rating given. I am looking at the descriptors used and the nosing and tasting notes. I like to ensure I am not missing anything. Often I find I agree with reviews of find more accurate descriptors. I was expecting to find numerous reviews on such a classic rum as Myers’s. Sadly I was left a little deflated as I found few reviews. Those I did were relatively brief and offered no further insights. So on with the rum. Myers’s Rum is 100% Jamaican Rum. So this is not going to be a rum for the faint hearted. Upon pouring from the thick dark brown bottle the rum reveals itself as a very rich dark brown rum. It is arguably very slightly lighter and more reddish than Gosling’s Black Seal but there is little in it. The nose (which was apparent as soon as the bottle was unscrewed) is very rich. Initially it is all caramel and burnt toffee almost like black treacle. As the aroma develops that rich Jamaican aroma also makes an entrance amongst the dense treacle. The rum is 50% inviting and 50% telling you to watch out! Myers’s is a blend of 9 different rum’s some research has suggested that some of this rum may be quite old, unfortunately I couldn’t find anything concrete to confirm this. The rum is at the very least 4 years old so it should be as the tagline I have seen attributed to it “Dark and Mellow”. I’m not sure who came up with the tagline “Dark and Mellow”. The Dark part I agree with but mellow? What fire water or kill devil was that bugger drinking? In terms of a sipping experience Myers offers one of the most bitter and fiery experiences I have had. Even with some really cheap and nasty booze. The rum on its own is unforgiving and really not a good idea. Is Myers’s Original Dark a sipper? Only in the eyes of the cracker that came up with the tagline “Dark and Mellow”! So I’ve kind of established what I knew already Myers’s Original Dark isn’t a smooth sipping experience. My research led me to believe that Myers’s is a cocktail ingredient used often as a secondary spirit in Tiki Drinks and cocktails requiring a little bit of oomph. It can be used in a Mai Tai or as a topper for a Zombie and a whole host of other cocktails can benefit from its rich and deep flavour. Well if it is any good it should be okay in a rum and cola. Bring forth the cola. Now if I’m paying £20 for a bottle of rum it sure as hell best make a passable rum and cola. If it can’t do that then the distillers should shut up shop and go find something else they are good at! Myers’s Original Dark mixed with cola is a very rich intense drink. Similar in many ways to Goslings Black Seal from Bermuda. Myers’s has a slightly more bitter profile and still displays its Jamaican roots. Myers’s also makes a very flavourful Rum and Ginger Beer. I would have trouble splitting the two to be honest. In terms of authenticity though maybe Myers’s gets it by a nose. Gosling’s has a slightly confected note which suggest some additives. From what I can gather the only additive in Myer’s is the unusual addition of some of the molasses back into the rum. This I understand not only contributes to the treacley intense nature of the rum but also adds colour. Whatever it does it certainly gives the rum a quite distinctive profile. This is something I like. A rum which is authentic but slightly different has to be a good thing? According to one source Myers’s Rum is an extremely popular dark rum in NAAFI’s (Naval, Army and Air Force Institutes) across the world. I wonder how much of this is the Navy. In many ways Myers’s would make a good substitute for a Navy Rum. So my conclusion on the Myers’s? Overall very positive. My local bar did have a bottle of this for years but no one ever bought it. I tried it a couple of times but due to the extortionate prices I only ever had a single measure (25ml) with possibly enough cola to drown the flavour (hard to believe). I’m pleased I revisited this rum. As a sipper it’s simply to fiery, it is very hot and spicy and burns too much to enjoy. As a mixer it must be wonderful for a cocktail bar owner as it will add flavour and a little oomph to just about anything. Mixed liberally with cola (as I often so enjoy £20 rum) it makes a very rich and enjoyable drink. Drinking this rum is a little bit of rum history. Even the bottle makes you feel like you are stepping back in time. I’m slightly torn between the score with this one. I’ll stick my neck out though. I’ll take the rum for what it is rather than what it isn’t. As it’s a classic and its stood up to the test of time I’ll give it a…….. In the US Navy, yeah it’s a good Navy rum lol. Personally I like it as a shooter, in lemonade where the flavor comes out in the citrus and honestly as a sipper as well but I tend to enjoy a powerful sipping liquor. The myers’s original is the best but today I quit buying it. Liquor should not be sold in plastic bottles. All I can say is this rum is the bomb!! It is so mellow and tastes great!! Myer’s Rum has an astonishing history that is little noted today. It has been diluted in age and in its strength such that it is barely recognizable now. As you wrote kindly of it, let me also speak kindly of the (virtually) dead.The Fred L Myers Company was founded in 1879. It built a distillery in Kingston on the tract now occupied by the Univ. of the West Indies. The distillery burned in 1917 and was not rebuilt. The sources of the marks that are blended for it are a deeply held secret. I know that Monymust goes into it and probably Long Pond because Myers was once owned by Seagrim, as were those distilleries. It was probably the first branded Jamaica rum. It is almost certainly the rum most prominently associated with the invention of the “modern” Planter’s Punch. It was the only non-Cuban rum widely advertised for sale in Cuba during the Prohibition era. Think about it ….. why would the Cubans import anyone else’s rum unless there was a specific demand for it. until the last barrels of the real thing were depleted in 1947, 30 years after the fire. There was also a 12 year old sipper bottled in the 40’s – 50’s. At 8 years in the barrel and an ABV of 97 U S proof, it made a planter’s punch which has never been duplicated. When not used for the punch, the Jamaicans drank it with a very dry and spicy ginger ale called D & G.
Great history! I was introduced to Myers after reading about Hemingway; Myers and Coke, chilled, no ice, short glass. Thank you glad you enjoyed the review! I get mine duty free at the Bangkok airport. I always enjoy it with a bit of soda on many a hot night iin Thailand. I agree it is a bold dark rum that I find I can’t compare.